Since there were few spaces for photographers to exhibit or sell their work in the late fifties, Arbus had to continually seek out magazine work. However, investigations into the production of this well-known photographer reveal that eight years of her work are absent from the art historical record. A cursory glance into her images of transvestites and homosexuals would lead one to believe that her work with these subjects began in 1965. Yet, her biographer, Patricia Bosworth, states that her first images of transvestites were taken in 1957 and her interest in these subjects continued until her death. It is imperative to leave behind the mystique built around her images, for only then can her ‘missing photographs’ be examined. Her work needs to be investigated from a socio-political standpoint, because her images of transvestites and other ‘sexual deviants’ provide a critical view into the conservative ideology of the day and reveal the underground culture that mainstream society was trying to keep out of sight, out of mind. Not only did Arbus not photograph popular motifs in the late fifties, she also lived her life very much against the mainstream notions of a ‘proper’ woman. She was married to Allen Arbus and was a mother of two girls, Doon and Amy; however, she was a working woman and did not remain married. Any expectations placed on her by society to adhere to the ‘proper’ roles prescribed for a wife and a mother were shattered once Arbus decided to pursue her own interests apart from the fashion world, leaving behind images of pretty girls in pink. Arbus gained custody of her two children but was never a ‘traditional’ mother. Since there were few spaces for photographers to exhibit or sell their work in the late fifties, Arbus had to continually seek out magazine work, a task that kept her busy.3 Some work was assigned to her, such as photo shots for the articles, Mae West Once Upon a Time (1965) and Not To Be Missed: The American Art Scene (1966). However, Arbus sought out many of her own subjects such as Mexican Dwarf in His Hotel Room, NYC (1970) and Hermaphrodite and His Dog in a Carnival Trailer, MD (1970). The photographs produced outside of her magazine work held little interest to people outside of her circle. For example, Two Men Dancing at a Drag Ball, NYC (1970) would have been considered dangerous and ostensibly labeled as ‘subversive.’ Even in the galleries that exhibited and sold photography, there was not a market for images of transvestites and homosexuals within the limited spaces dedicated to photography. It was not until 1965, eight years after her first image of a man dressed as a woman, that one of Abus’s images of transvestites was exhibited for the first time at the Museum of Modern Art Recent Acquisitions show, curated by John Szarkowski. Arbus had four pictures in the exhibition, only one of which portrayed two female impersonators.4 However, the reaction to her images was intense anger, an emotional response prompted by the cultural war against sexual ‘deviants.’ Yuben Yee, the photo librarian at the MoMA, recalls having to come early every morning to wipe the spit off of Arbus’s portraits. He recalls that, “People were uncomfortable—threatened—looking at Diane’s stuff.”5 Even within the art world, Arbus was thought to be photographing subject matter that was ahead of her time. As Andy Warhol, who had seen some of Arbus’s portraits commented, “drag queens weren’t even accepted in freak circles until 1967.”6 Arbus’s images were not only disturbing to her audience on an aesthetic level, but her unabashed and unapologetic views of transvestites touched a deeper nerve in the people who viewed them. The photographs produced outside of her magazine work held little interest to people outside of her circle. 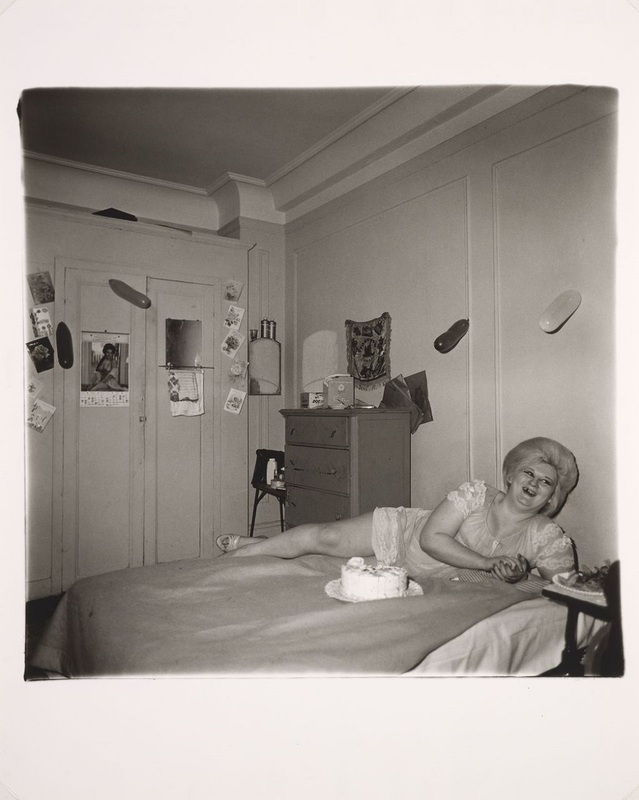 It is interesting to note that although Arbus is noted for her images of deviants and freaks during the Cold War era, relatively few of her images of transvestites are known. A Young Man in Curlers at Home on West 20th Street, NYC (1966), is the earliest published image of a transvestite. It was published in Diane Arbus: An Aperture Monograph. The early photographs are the most ‘subversive’ and available only through the Estate of Diane Arbus. Although it is due to the unwillingness of the Estate of Diane Arbus to release the earlier images that they remain largely unknown and unacknowledged, her images from 1965 on have been widely published. This recognition of her foray into the ‘sexual deviant’ is evident, as the five photography survey books all variously listed Arbus’s subjects as transvestites, homosexuals, and freaks. And yet, the representative images the authors chose to demonstrate Arbus’s subjects featured Arbus’s more socially acceptable images of ‘freaks’ and not her images of transvestites. For example, A History of Photography featured, A Teenage Couple on the Street, N.Y.C. (1963), the World History of Photography included, Mother Holding Her Child, N.J. (1967), American Photographers reproduced Untitled (7) (1970-71), an image of patients from a mental hospital, and Photography in America chose A Lobby in a Building, N.Y.C. (1966), Untitled (4), 1970-71, and a Woman with a Veil, N.Y.C, 1968. Only in Naomi Rosenblum’s second survey book, a History of Women Photographers, is one of Arbus’s more politically challenging images included, Seated Man in Bra and Stockings, N.Y.C. (1967). Perhaps it is because Rosenblum’s book is the most recent that she in- cluded this ‘subversive’ image or maybe it is because Rosenblum’s mission was to highlight women and the changes they provoked in photography that she included the image of a transvestite. But for whatever the reason, or maybe because of all of them, a viewer new to the work of Arbus, presented with the current scholarship, would ostensibly assume that Arbus’s interest in and photographs of transvestites began in 1966. However, her earliest images of ‘sexual deviants’ date back to the streets of New York City in 1957. As Arbus spent more time at Club 82, an increasing familiarity became apparent in her photographs. The exaggerated female-like poses were replaced with more natural, ‘womanly’ poses. Arbus was concerned with how bodily decoration, like make-up, dress, and jewelry, were used by the men to produce an image that was congruous with the culturally-determined idea of how a woman should look.10 After all, gender is not biological; it is culturally determined and, therefore, patterned differently in various societies. To these men, who wished to be viewed as women, gender became a performance, a parade, in which they donned the props that were generally associated with femaleness and femininity. The poses that Arbus chose to capture were incredibly calculated and posed to challenge the boundaries of culturally defined gender. The images investigated and questioned the sexual duality inherent in transvestitism and emphasized the extent to which gender is not biological, but rather a phenomenon that could be donned and removed. For example, in one particularly powerful image of the tension and duality of transvestites, “One impersonator’s image is successively fractured in a series of make-up mirrors. Her woman’s hat and make-up appear in one mirror while another reflects her male arm and torso.”11 In another image, Arbus captures a man with a female wig and make-up tensing his biceps like a weight lifter. In this case, in which there is a man who is dressed like a woman but creating a manly pose, the impersonator is mocking the arbitrariness of culturally-defined gender roles and accoutrements. As Arbus spent more time at Club 82, an increasing familiarity became apparent in her photographs. The exaggerated female-like poses were replaced with more natural, ‘womanly’ poses. Ostensibly some of the self-consciousness of the subjects projecting themselves as women through masquerade vanished. It seems that backstage and among other transvestites there was less of an impetus to ‘perform.’ Her later photographs of 1961 and 1962 demonstrate an increased naturalness in the ‘poses’ of the impersonators, now shown participating in pedestrian activities of everyday life, eating or reading, revealing the prosaic humanity of these alienated men. As her subjects began to ignore the camera she was able to erase the extraordinary qualities of the performers. To further understand why Arbus’s images of transvestites would have been labeled as subversive, one must investigate the social and political milieu of the fifties and early sixties. After 1963 she changed her approach to photographing the same subjects again.12 She moved out of the dressing rooms and the place of business for these men and entered their homes and bedrooms. Also, the legs and arms of the impersonators, which functioned to shield the whole body from the lens, open up revealing their bodies. For example, in A Naked Man Being a Woman, N.Y.C. (1968) a man, without the help of props, uses his opened body to display his femaleness. This man’s personal transformation into a woman within his own home reflects the intimacy Arbus shared with her subjects. Perhaps her early images of transvestites are kept from the public because they glorify the female impersonator, which was synonymous with professional homosexuality in the mind of the general public of the day.13 Because of this the impersonators were greatly stigmatized within the culture; they did not attempt to fit into mainstream culture but rather acted-out and in a conspicuous manner paraded their ‘deviance.’ However, it is interesting to observe that Arbus’s later photographs seem to draw the impersonators closer to mainstream society. By abandoning the props and accessories used to create the notion of a woman and employing only their bodies, they appear less alienated from society than her former images of performers. Perhaps that is why the Estate has chosen to release the images from the later period. To further understand why Arbus’s images of transvestites would have been labeled as subversive, one must investigate the social and political milieu of the fifties and early sixties. Beneath all of the glowing magazine covers of happy mothers in the kitchen, tupperware parties, and family barbecues, there was a burgeoning fear of clouded sexual roles and a need to codify what was acceptable behavior for men and women. As society grappled with the enormous task of defining the socially constructed gender roles that were to be the ‘norm,’ the government turned to science to create the empirical numbers needed to outline the limits of acceptability. The Gough Femininity Test of 1952 ‘proved’ that appropriately adjusted ‘feminine’ women characterized themselves as dependent, obliging, and sentimental.14 It was concluded that “male sexual deviants responded in the feminine direction on the masculinity-femininity scales” and that these individuals could be described as “feminine.”15 Women and ‘the deviant’ became linked during this time period, and women were often viewed as the instigators of the confusion that was deleterious to societal morality. Popular magazines of the day featured stories of what happened when women usurped traditional male roles. In 1956, a Life article articulated the story of a woman who took on a dominant role within the household, driving her husband to drink. Finally, the woman was left to support the house, a very ‘unnatural’ and undesirable role and her husband was left impotent.17 These tales, read by both men and women, functioned as ‘warnings’ of what could happen if the sexes did not perform their duties correctly.18 They were probably also meant to ‘scare’ a couple into making sure their ‘proper’ positions were rigidly defined and maintained, since no ‘decent’ woman would want to be responsible for the decline of her household. The concern over mothers in the workforce jeopardizing the sanctity of sexual roles had been present for over a decade and prompted numerous statements that referred to the damages ‘unnatural’ women could inflict on their children. In 1944 J. Edgar Hoover entreated mothers to stay home as “parental incompetence or neglect led to ‘perversion’ and ‘crime’ in children.”19 In 1950, Robert Coughlin, when referring to working mothers wrote, “She may find satisfactions in her job, but the chances are that she, her husband and her children will suffer psychological damage, and that she will be basically an unhappy woman.”20 And again in 1963, “The new freedom and new activities of women and girls may affect the boy’s role and confuse his conception of his proper place in the culture.”21 It was believed that this confusion that might lead to the creation of a transvestite or homosexual. Ironically, mothers who stayed at home to raise their families could come under even greater scrutiny during this era. If a boy showed the slightest tendency for effeminism, the stay-at-home mom was automatically accused of coddling her son and creating a ‘sissy.’ In fact psychologists, educators, and child-development experts of the 1950s thought that “Millions of American boys and girls…are so far on their way to becoming sissies that only professional help will save many of them.”22 Within the home, it was of the utmost importance that men continually remind wives of their secondary and submissive role to their husbands. It was the duty of fathers/husbands, along with the help of women’s journals, such as Better Homes and Gardens, to make sure that women did not ‘sissify’ their boys to the extent that they would no longer be able to perform ‘natural’ male duties, such as, car repair, lawn work, hunting trips, archery.23 These were initiation rites that turned boys into ‘real men’ and it was the father’s responsibility to teach his boy these activities. For if left up to a domineering and overprotective mother who was there to pick him up after every fall, a boy risked becoming a ‘mama’s boy’ or a ‘sissy,’ the biggest fear of any self-respecting parent. However, in the fifties and sixties it was more than just social concerns about sissies that shaped the fear of a nation; ‘waging peace’ and political Cold War ideology developed into a national priority and intensified the anxiety surrounding sexual deviants. The threat of Communism was an overriding fear for Americans at the time, and this concern set the stage for the explosive reaction that accompanied the 1950 Senate report, which stated that most of the ninety-one employees who had been “dismissed for reasons of ‘moral turpitude’ were homosexuals.”24 Joseph McCarthy had warned that the greatest threat to freedom and democracy were the “the Communists right here at home, lurking in our schools, factories, offices, even in churches and government.”25 The link between homosexuals, or ‘sexual perverts,’ as they were also referred to in governmental literature and Communism was made almost immediately. The threat of homosexuals in governmental offices was thought to be self-evident, since ‘deviants’ lacked the morality that the government championed. Further, it was thought that the sexual appetite of homosexuals was insatiable, and therefore, they would never be able to concentrate on work; they would be too busy trying to find another ‘deviant’ to ‘take to bed.’ Homosexuality was treated as a contagious disease and there arose an urgent need for homosexuals to be expelled from government jobs. YOU MIGHT ALSO LIKE: Diane Arbus: "Stamped on Verso"
The threat of ‘sexual deviants’ and homosexuals ran deep in the minds of politicians, as acknowledged in the New York Times article, “Perverts Called Government Peril.”27 As their sexual identity and position in society were secretive and any acknowledgement of it would have led to ridicule and loss of employment, the government was worried that Communist spies would easily blackmail ‘perverts.’ Also, the government recognized that homosexuals and other ‘deviants’ had managed to blend into mainstream society and had achieved high level positions within the government, much like Communist spies, who were also able to enter positions without detection. Further, the way in which homosexuals were thought to identify one another was thought to be similar to the code used by Communists to communicate with one another. This ‘kinship’ between the two groups only furthered the hostilities towards ‘sexual deviants’ and threatened their liberties as United State citizens. The security of the State was foremost in the government’s mind. The security of citizens only extended to those loyal to the government; this did not include ‘sexual perverts,’ labeled as dissidents. Most likely Arbus herself would have been viewed as a threat to mainstream society and her images considered subversive. This was the conservative and paranoid atmosphere in which Arbus was working early in her career. Most likely Arbus herself would have been viewed as a threat to mainstream society and her images considered subversive. This probably kept her from showing her early work in public arenas. However, her images from the late sixties and seventies are well known and celebrated, yet it was an era with a very different political ideology. The changes the occurred during the mid-sixties transformed the nation forever, allowing people and ideas that had been shunned and forbidden just a few years earlier to be expressed. This new ideology is reflected in the reception and acceptance of Arbus’s later images. Yet, despite this shift in mindset, the Estate of Diane Arbus still will not release her early images of transvestites and her work remains shrouded behind the veil of the conservative Cold War era. Perhaps the social taboos of her early images linger on, the impact of the previous era remaining alive in the present. Moreover, a changed climate does not always retroactively depoliticize images and perchance this is why the photographs remain off-limits. So, even in the case of this well-known photographer, images that were politically dangerous are still being kept from general view and discussion, allowing the politically conformist ideals of the fifties and early to mid-sixties to be perpetuated. Words and phrases such as, freaks, sexual deviants, and sexual perverts are used throughout the paper. These phrases and there negative connotations are used within the mindset of the fifties and early sixties, and are not my own beliefs. Any biographical material relating to Arbus can be found in her biography, Patricia Bosworth, Diane Arbus: A Biography (New York: Alfred A. Knopf, 1984). Unfortunately, I was not able to reproduce the images discussed in the paper. However, I have attempted to list the titles and dates of the few photographs that have been released. All of the images mentioned within this paper can be found in: Diane Arbus: An Aperture Mongraph (New York: Millerton, 1972) and/or Doon Arbus and Marvin Isreal, eds., Diane Arbus: Magazine Work (New York, Millerton, 1984). Jonathon Greene, American Photography: A Critical History 1945 to Present (New York: Harry N. Abrams, 1984) 122. Helen Gee, Limelight: A Greenwich Village Photography Gallery and Coffeehouse in the Fifties: A Memoir by Helen Gee (Albuquerque: U of New Mexico P, 1997) 5, and Jacob Deschin, “Galleries Needed: Many Good Pictures with No Place to Show Them” New York Times (August 1, 1954) sec 2:12. Throughout this section, I have used descriptions of the photographs that are available because of invaluable research done by Diana Emery Hulick. Ms. Hulick has been granted access to the Estate archives and contact sheets and has written on some of her findings. Her article, “Diane Arbus’s Women and Transvestites: Separate Selves,” History of Photography 16 (1992) 32-39, was extremely helpful in my research. Because the photographs exist only as contact sheets, I had to rely on Ms. Hulick’s descriptions in her article. Ms. Hulick has provided art historians with a wealth of knowledge about a very secretive subject, and I am indebted to her work on the subject of Diane Arbus. Esther Newton, Mother Camp: Female Impersonators in America (Chicago: The U of Chicago P, 1972) 3. Harrison G. Gough, “Identifying Psychological Femininity,” Educational and Psychological Measurements 12:3 (1952) 430. Robert Coughlin, “Changing Roles in Modern Marriage,” Life41:26 (December 24, 1956) 112. Ariella Budick, “Diane Arbus: Gender and Politics,” History of Photography 19 (1995) 124. Andre Fontaine, “Are We Staking Our Future on a Crop of Sissies?” Better Homes & Gardens (December 1950) 154. “Perverts Called Government Peril, “ New York Times(April 19, 1950) sec 1:25. Posted in Essays, Highlights and tagged Diane Arbus, Essay D, Laureen Trainer, LGBT, Popular Diane Arbus, Portrait, The New York School.